I’ve had a Smoothwall Express server that I built for 5+ years now running in my office on Verizon FiOS. 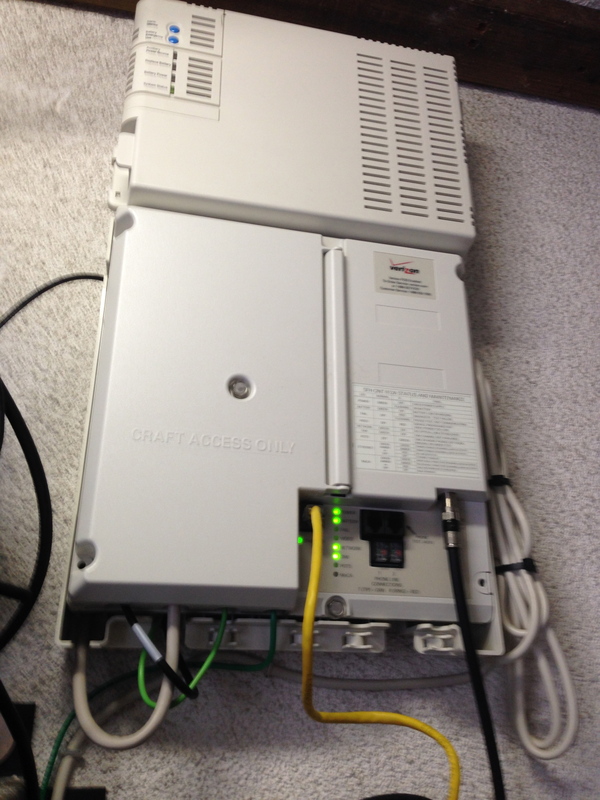 My setup is probably not the typical FiOS where the Verizon router is setup using MoCA. I didn’t need that because in the two FiOS installations I’ve ever had, I requested that the ethernet jack be enabled on the Opitcal Network Terminal (ONT). Therefore, the original FiOS router is nowhere in the equation. When you plug in a new device to a cable or DSL modem, you need to wait a little bit for the current DHCP lease to expire or clone your mac address. If you ever want to change from the FiOS router, or switch your hardware, you must either clone the mac address, release the DHCP lease, or leave the ethernet unplugged for anywhere between 2-12 hours. I knew this back from the days of using Optimum Online cable. All I had to do was make sure to clone the MAC address of the device to the new one. In preparation for the installation of an Ubiquiti EdgeRouter, I cloned the mac address of the network interface card on the smoothwall that served eth0 to eth0 on the ER. Surprisingly, cloning the mac address did not work for me to obtain a new DHCP lease on Verizon FiOS in an ethernet installation. I still don’t know how this is possible. After an hour of being unable to get this to work, I had no choice but to give up and go back to the drawing board. It appeared that other users have had the same experiences that I did — unable to get a lease with the same mac address, but only after a re-installation and/or switch to other hardware. I do not know if this is a specific problem with Ubiquiti ER unable to clone the mac address correctly or not, but it is something to be aware of. Considering that this has happened to users while reinstalling smoothwall from time to time, I don’t think it is entirely unique to Ubiquiti. The important thing to take away from all of this is that cloning the mac may not work as you expect. If your attempts to clone the mac address of a device on your FiOS fail to renew the lease on your new device fail, you only have two options left: wait for expiration, or attempt to release the lease from your current device. How long you need to wait if you decide to let it expire depends on where you are with the lease renew time. For example, if the DHCP lease was renewed at 2AM, it will expire at 4am (2hours), but renewal is typically made at half time (3am). So, could be as soon as 1hour 1minute. This is still less than ideal because you will have downtime on your line, so if that’s important, you will want to try to just release the lease yourself. If you’re using the Verizon router, it’s actually simple to release a DHCP lease from the Actiontec within the GUI. However, if you’re running your own hardware, that might be a little more tricky and varies from device to device. The post I made on DSLReports was pretty eye-opening: one user waited 12+ hours for the lease to expire and could not get their pfSense based box to work. Others reported that the DHCP lease command worked on Verizon’s Actiontec but not in pfSense. I attempted a suggestion to hook up a laptop with windows directly to the ONT and run ipconfig /release, and then unplug. This did not work. Windows complained that it could not actually find an active network to send the command to. I waited 10 minutes or so just to see if this was normal, but it did not release. I plugged Smoothwall back in and confirmed this to be the case – Verizon took it back without a problem. The last thing to do was try a DHCP release from Smoothwall Express. Express provides no way via the GUI to release a DHCP lease, but fest3er on the smoothwall forums gave me a workaround. By running killall -1 dhcpcd, the DHCP lease was released the moment it was SIGHUPped. This finally worked, I waited about 5 minutes, hooked up the Edgerouter and it granted me a brand new IP address and lease. For the sake of trying, I tried plugging in the smoothwall after this to see if it would connect, and it would not. It was rejecting the smoothwall now instead of my Edgerouter, despite them both sharing the same mac address. Additionally, I did not have to restart the ONT or power it down once to make this change occur. I believe that — at least for my installation — thinking of the Verizon ONT as anything more than a signal conversion unit is probably not accurate. The ONT is not like a cable modem; it does not have any actual address on Verizon’s network. Your in-house devices do. Leave the Verizon ONT alone because restarting it to switch hardware around is mostly a waste of a time. In short: break the lease, wait for it to expire, and leave the ONT alone. When all else fails, of course call Verizon and ask them to reset it for you.